Israeli armed vehicles entered Nablus just before 1pm, speeding around and firing randomly. Newly arrived international visitors, unused to the thunderous echoes from town’s rocky hillsides thought they were under full scale military attack. Apache helicopters whirred overheard, their conspicuous presence preparing residents for an assassination. F-16 fighter jets screeched across the sky (Fighter? The Palestinians have no anti-aircraft weapons, let alone an air force). International visitors stood dazed in the surreal atmosphere of giant war film set. But we soon felt real fear too. This town has been bombed from the air before. As we stood and tried to track the movement of the Jeeps and Hummers through residential areas, phone calls came in from friends in other places. The army was shooting in El Ein refugee camp. Jeeps had arrived at the Balata refugee camp. Homes were occupied on the hillsides. By the time we arrived to join the medics the army had left, like a cartoon chase. Our usually unshakeable Palestinian friends from the medical volunteers became nervous, speculating on the reason for the huge military presence. Aircraft, helicopters, a drone and tens of ground vehicles are not for nothing, they reasoned. Perhaps they have already filled the city with plain-clothes Special Forces to arrest or kill people, or perhaps this is just the first phase of a huge military attack on the town like the invasions of 2002. 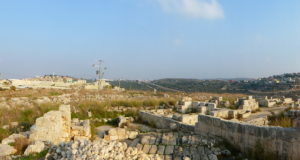 Some news stations reported that two plain clothes Israelis, Special Forces, had entered the city and were lost presumed taken by Palestinian fighters. Allegedly, the Israeli army had given the Palestinians two hours to hand them over before a full military attack on the town. The usually boastful resistance fighters denied involvement or knowledge. The story seemed implausible. We spoke to a captain in the Palestinian Authority forces who also disbelieved it. “If two Israelis were in here, the Israeli army would contact us to ask the fighters to hand them over.” No such contact was made. As is so often the case, the first casualty is truth. When we reach Balata refugee camp, ten jeeps and hummers are on the main street outside, with more on the other sides of the camp. No one heard the Israeli occupation army actually announce a curfew but it makes little difference. Roads are closed to all Palestinian vehicles, shops forced to close too, and most residents have locked themselves inside their homes. Children wander around the camp with spent tear gas cans and “rubber” bullets (metal cylinders coated in rubber) as souvenirs. Medics and journalists try to cross the army line into the camp but the soldiers aim their M16s to stop them and don’t explain why. activists accompany a sick amputee to his home along a street outside the camp, soldiers tail and harass them all the way. 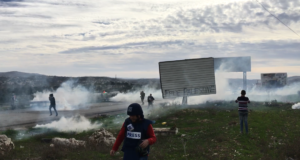 Unprovoked, the Israeli army hurls gas grenades into the camp. Palestinian teenagers laugh as inexperienced international peace activists scatter and abandon phones, bags, and expensive cameras. Dutiful kids return the items and offer onions (that help relieve the effects of gas) and water while the visitors compose themselves. Small children lean out of windows to shout greetings to the foreign visitors, far more interesting and unusual than another army attack. A whole generation has grown up to think that being shot at is more normal than seeing a pale skinned stranger. Later two foreigners, one an international journalist, are cornered in a shop front by a gas grenade thrown at them. 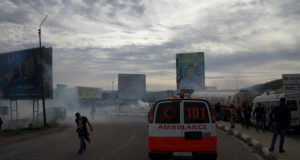 Trapped in a cloud thicker and stronger than the tear gas fired from canisters, one foreigner suffers mild facial burns. The drone and a helicopter are still overhead but the ground vehicles began to withdraw at 5:30pm with no clear objective attained from the operation. What happened here today? No arrests or assassinations reported and nothing seized. As frequently as we report these abuses, we hear from people outside that things seem better here now, as though the only troubles are petty squabbles between two equal opponents. When will the media report this conflict fairly? When will the world see that Israel is the aggressor here? Tonight few people in Nablus and Balata will sleep well and instead fear the start of a new campaign against them. It is the responsibility of the International Community to curb Israeli aggression.